The Surprising Cultural Stamina Of Pokemon : All Tech Considered Fifteen years ago, pocket-sized characters known as Pokemon arrived on American shores from Japan. The cute creatures were suddenly everywhere: television, video games, card games and a movie. But few people imagined that in 2013, the franchise would still be going strong. 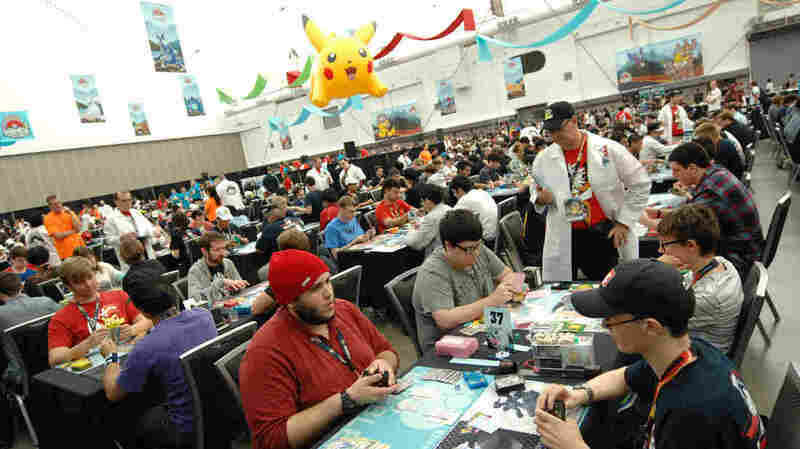 Participants compete in the 2013 Pokemon World Championships in Vancouver, Canada, on Aug. 10. The Pokemon franchise has become a billion-dollar franchise since it debuted on American shores 15 years ago. Fifteen years ago, pocket-sized characters known as Pokemon arrived on American shores from Japan. The cute creatures were suddenly everywhere: television, video games, card games and a movie. When the Pokemon cartoon theme song first hit American TV airwaves in 1998, "Gotta catch 'em all" became a mantra for kids. But few people imagined that in 2013 the stars of this cartoon would still be going strong. "Pokemon's a more than billion-dollar business each year," said J.C. Smith, the marketing director for the Pokemon Company International. Fifteen years ago, the makers of Pokemon made a bet that releasing a video game, card game and cartoon all at once would launch a franchise that could stand the test of time. For now, the bet is paying off, as the second generation of Pokemon players watches the cartoon and takes up their game consoles and cards. "We do benefit from having been around as long as we have because there are dads who are playing with their kids now; these dads grew up with it and love it," Smith said. On a Sunday afternoon at Game Empire in Pasadena, Calif., one of Los Angeles County's biggest game stores, two generations of Pokemon card players — ages 8 to 38 — gathered for friendly competitive play. Together. Nine-year-old Mark, who was testing his skills against a player almost three times his age, explained the basics: "First of all, you have to have Pokemon that have high attack power." Mark said Suicune was a good Pokemon character. "[He] has a really good ability, safeguard, that means it can't be damaged by E-Xes." I asked 23-year-old Taylor Jansen, who runs the card-gaming group, to explain the ties between the card game and the video game (which is made by Nintendo). The video game, he said, leads the way. "So when a new game comes out, that's when new Pokemon come out, and new mechanics come out and stuff," Jansen said. "So that trickles into the card game and that same marketing gets a bigger base for the cards and the game." Sales of the latest edition of the video game released in October were brisk. Nintendo sold 4 million games worldwide on the first weekend. But some gamers are skeptical this can last. The video game part of the franchise relies on old-school devices, namely Nintendo handheld consoles, that are being quickly replaced by smartphones in gamers' pockets. And that's the catch. Nintendo is stuck wondering if letting Pokemon roam free on phones will wipe out the handheld hardware market. The answer to that question will determine what a second 15 years of Pokemon will look like. Noah Nelson is a reporter for Turnstylenews.com, a tech and digital culture site from Youth Radio.